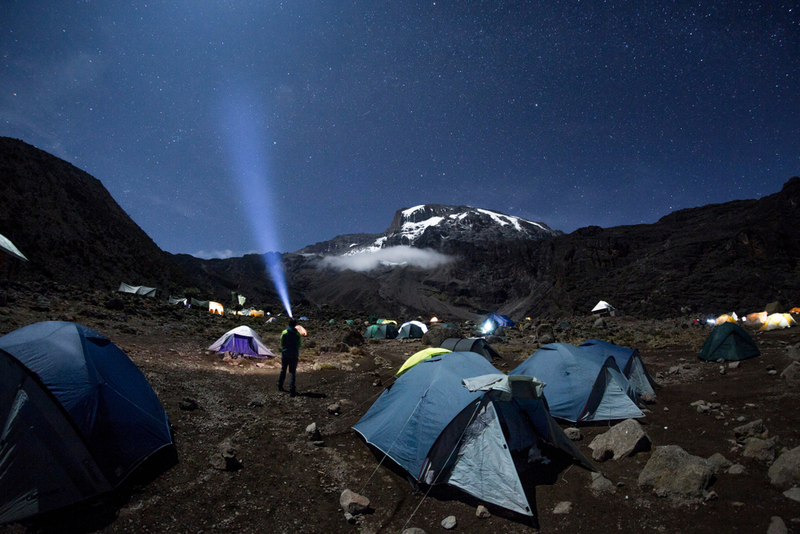 Are you climbing Kilimanjaro but don’t know which route to pick? As the popularity of climbing Mount Kilimanjaro continues to increase, potential climbers are often uncertain as to which route to take. This site will explain the differences between the routes and help you decide which is the best for you. The descent routes are assigned based on the ascent route. Climbers do not have a choice as to which route to use when coming down the mountain. Some operators will make blanket statements that a particular route is “good” or “bad” but the truth is that each route has its own advantages and disadvantages. There are situations when each route has its own merit. Umbwe is steep and ascends quickly and most would be wise to avoid it if they have never done high altitude trekking. However those who are already well acclimatized or know they can acclimatize quickly from experience can climb this route without hesitation. We had three groups of eight active US Army veterans who were stationed in Afghanistan climb the Umbwe route. They had a 100% success rate. Shira is a scenic route that begins with a drive through the rainforest section. It has a relatively high starting point compared to the other routes. Generally this route should be avoided because it is better to trek through the rainforest for gradual elevation gain. However if one is confident that being driven to an altitude of nearly 12,000 feet will not pose a premature acclimatization issue, Shira is a fair choice. It allows for one to reach a higher elevation quicker which will jumpstart the body for acclimatizating to the upcoming higher altitudes. Marangu is usually quite crowded and most operators steer their clients away from this route. However, Marangu has one huge draw. It is the only route that uses hut shelters instead of tents. That means clients can sleep completely protected from the elements and on a bed for the entire climb. For people who absolutely cannot sleep on the ground due to discomfort or back problems might want to use Marangu. Additionally, when climbing during the rainy season Marangu is a reasonable choice. Not only because of the shelter, but because the main drawback of this route, the crowds, are gone at this time. Northern Circuit is a phenomenal route – but also a long one. Usually that is a good thing because the longer one stays on the mountain, the better the altitude acclimatization. However for those who have never camped before and do not particularly enjoy it, it can be a struggle to spend nine days on the mountain. These people should opt for a shorter route. As you can see, you may have very valid reasons for choosing or avoiding any given route. When selecting the route, make sure it is the appropriate route for your desires, physical ability, aptitude and comfort level. Do not let your guide service choose for you! They will likely steer you to the route that they want to lead. To choose the best Kilimanjaro route for you, there are plenty of variables to be mindful of. 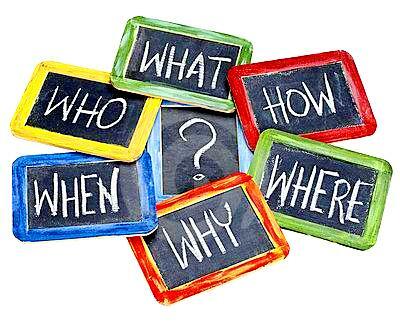 Take some time and consider these questions. Who: Who is climbing? The whole group’s abilities must be factored into choosing a route. Are there novice hikers in your group? What about children or older people? Are there people who have never been to high altitude? Pick a route that the members of your party can realistically succeed on. What: What limitations surround your climb? Are you bound by a budget or the number of days on your trip? There are cheaper routes and there are more expensive routes. There are short itineraries and long itineraries. Get an idea of how much money and how many days people are willing to spend on the mountain and adjust accordingly. Booking a trip and then not having enough money to prepare is a bad thing. So is arriving in Tanzania from a long flight and immediately starting a climb without taking a rest first. route or a less strenuous one? Do you want to have more downtime at camp so you can socialize with the group or would you rather spend more time on the trail? Climbing Kilimanjaro can bring about a lot of discomfort and suffering given the physical nature. Some people don’t want to be pushed too hard while some crave the challenge. The answers to these questions will determine which route is for you. Where: Where do you want to begin your climb? 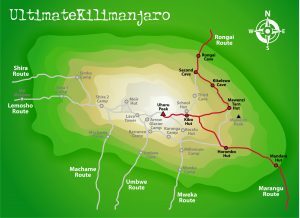 The routes up Kilimanjaro start from all sides of the mountain. Where you begin will affect the cost. It will also affect the scenery and scenic variety you experience. For instance, the western routes are more scenic because they cover more of the mountain. Why: Why are you climbing? Is it very important to summit? Then choose a route with a high success rate. Do you want to take the best photos? Then pick a scenic route. Do you want to get away from people? Then choose a less traveled route. Do you just want to be there? Then choose a quicker, less expensive route. When: When are you climbing? Climbs around holidays and full moons are especially crowded.The weather (and the number of people on the mountain) will change drastically between the high and low seasons. If you are climbing during the dry season, then all routes are open and doable. But if you are climbing during the rainy season or the shoulder seasons, then some routes might be impassable due to washed out roads or trails. Some routes receive less rain. The route you select can play into the climb’s overall difficulty. 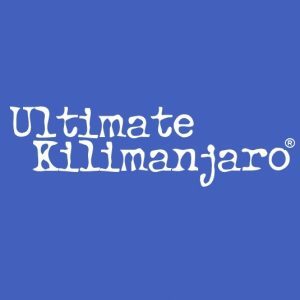 There is no “best” Kilimanjaro route! Below are brief descriptions of the climbing routes on Mount Kilimanjaro, the distance roundtrip and the number of days. The routes have starting points located on multiple sides of the mountain. The routes vary distance and accordingly so do the completion times. There are relatively easy trails, difficult routes, and even dangerous ones. Certain routes are favorable for altitude acclimatization due to their route profile. There are routes that are better when climbing during the rainy season. One route offers hut accommodations while the rest are camping routes. 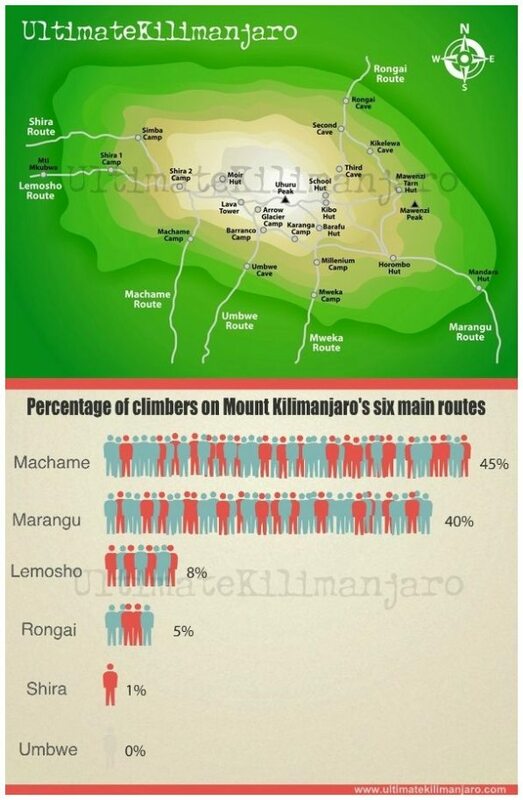 Machame is the most popular route on the mountain, with an estimated 45% of all climbers using this route. 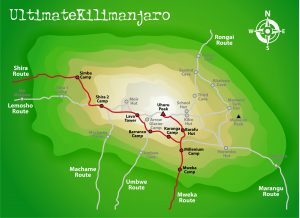 Next is the Marangu route, with an estimated 40% of all climbers opting for this route. Lemosho and Rongai see far less use, but are the preferred routes for the more reputable (expensive) Kilimanjaro outfitters, and are thus growing in popularity. Shira, Umbwe and Northern Circuit barely have any foot traffic. The known success rates for the abovelisted routes depends on the number of days rather than the specific route itself. The reported success rates are: 5 days (27%), 6 days (44%), 7 days (64%), 8 days (85%), all routes (45%). Picking the wrong route can mean a unnecessarily difficult trek, a failed summit, or getting sick and/or injured. So it is necessary to compare the different elements that makes each route unique. 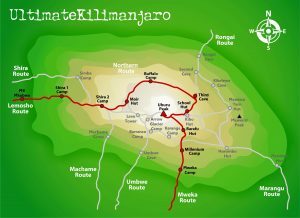 Remember: pick the kilimanjaro route that is right for you! Here are some general helpful tips when climbing Kilimanjaro. Choose a longer route. You have more time to acclimatize if you are unsure of your ability. Adding a day or two can increase your odds of success. Climb during one of the dry seasons. The best times are December – February and July – October. Nice weather makes the climb easier in many ways. Find a solid guide service. Their guides are better trained to deal with altitude sickness and other emergencies on the mountain. Your life is priceless, and certainly worth more than saving a few hundred dollars. Additionally, the good operators will serve better food and have better equipment – both of which keep you healthier and stronger on the mountain. Take training seriously. The summit and immediate long descent is very tough. Do not underestimate how tiring it is to come from 19,340 feet to 9,000 feet. Bring the right gear. You need apparel that will keep you warm and dry. You also need well broken in, comfortable boots. You will be spending a lot of time in them. Take care of your feet too.